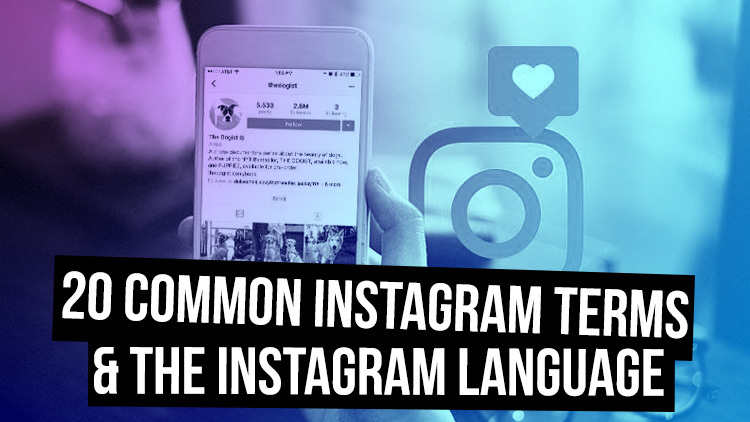 We put together a simple cheatsheet that explains many of the common Instagram terms and their meaning. We also added a quick overview and walkthrough of the Instagram mobile app below so you know exactly what we are talking about here! Enjoy! The name a person uses on Instagram to define their profile address (their username). This may be any configuration, and does not have to relate to their actual name. What does 'IG' mean on Instagram? What you call people on Instagram also known as the Instagram community. Biography in your profile… People usually refer to the link in their “bio” in their call to action. Basically it’s your profile. This is precious real estate on Instagram. Your bio will be the first thing that your prospective followers will see. It's also what your followers will see every time they visit your profile. To add a @ symbol in front of another Instagram users username. Should look like this @AprilMarieTucker. You can also add tags to in the photo by using Instagram's tag feature by either adding tags after you’ve uploaded your post and are on the description page, or by clicking the 3 little dots lower right corner of your post. IG Stories is another way you can share photos and videos with your followers. Stories disappear from your profile and Feed after 24 hours unless you add it as a highlight. This is a great tool to use for your business and grow relationships with your followers. It's best to use it to show off more of a behind the scenes photo or live video to grow a rapport with your followers faster than ever before. Definitely another must for having a successful brand on Instagram. SuperZoom - Records video and zooms in automatically playing a dramatic sound. Boomerang - Is a burst of photos that loops backward and forwards. Rewind - Is a feature you can use to record your video in reverse. Stickers - fun little images you can add to highlight or give character to your stories. Instagram Live is a feature of Instagram stories where you can broadcast to your followers. 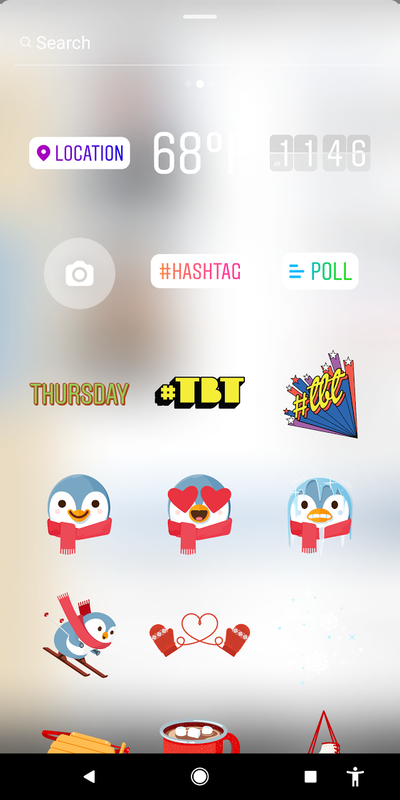 Like stories, your live only is posted on Instagram stories for 24 hrs but recently Instagram made an update that allows you to download your lives so that you can post or repurpose them for other social media or blog posts. Instagram Lives is another amazing tool & feature to use if you want to grow your brand on Instagram. Are stories or Instagram lives that you can highlight on your profile, even after they disappear on stories. Highlights appear below your bio. Abbreviation for “application”. It is a software application downloaded to your mobile device that provides access to the Instagram site. or like a post. You do this to let people know you like their post by tapping twice on their image. Double tap a photo to show your love for it! - Most newer smart phone devices come pre loaded with them, and for many, that's all you will need. I actually like an app called SwiftKey keyboard + Emoji’s. For me, this is the best for emojis, and it also makes texting a lot easier from my smart phone. You can also do a search in your app store by search “FREE Emoji’s”. A Filter is an editing feature which can be applied to your post to enhance features and colors. Instagram users or IGers that follow another IGer. The people that an Instagram user follows. A collection of a user’s Instagram posts. The “#” symbol placed in front of a keyword. Hashtags should be keywords or phrases relevant to the description of the Instagram post. Hashtags are searchable tags on Instagram. The Home screen is the list of activity of all the users you follow. Also referred to as the feed. A gathering or meeting of local Instagramers to take Instagram photos. Often used to describe the Instagram video feature. Where you’ll see all the posts and images shared by those you follow. This can be accessed by clicking on the 'house' icon on the bottom navigation panel. Any video or image content uploaded to an Instagram profile. This is your account information on Instagram. Your profile consists of your name, username, profile photo, and your photo gallery. Now that we've got you speaking the Instagram language, let's get you a quick overview of the Instagram mobile app so you know what you are looking at when you start to use it. 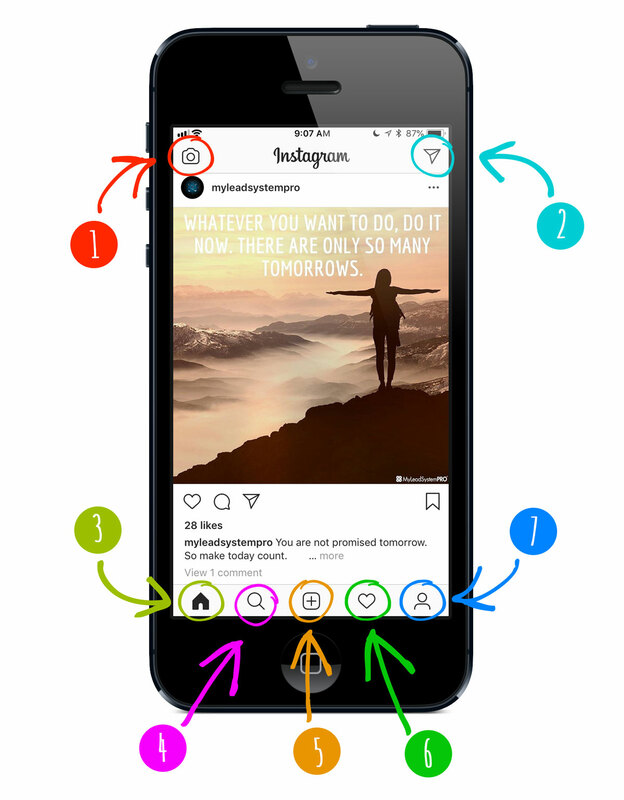 Take a look at the image below, and we'll explain what each of those buttons and icons do so you feel like an Instagram pro in no time! When you are on the home tab, you can tap the 'camera' icon in the top left hand corner to start adding photos and videos to your Instagram profile. There are a lot of fun options here, from going live, to using crazy filters that turn you in to a dog. Have fun! NOTE: You will need to allow Instagram to access your camera and microphone before you can use this feature. Tapping the 'paper airplane' icon in the top right from the home tab will get you access to your direct messages. Here you can view messages from people as well as create direct messages to send to your friends. This is the default view when you open the Instagram app. It's also where the media, images, and stories from the people you're following will appear. From the home tab you have access to add photos/videos to your feed, access your direct messages, search, connect and access your profile settings. Tapping the magnifying glass will take you to the 'search' page. From here, you can search for accounts, keywords, hashtags, and topics simply by typing in the "Search" bar at the top of the screen. This is where the magic happens! By clicking on this button, you'll will see your phone's camera popup. From here you can either choose to add a photo or video from your camera roll (already on your camera) or choose to take a new one. NOTE: You will need to allow Instagram to access your camera and microphone before you can use this feature. Tapping the 'heart' icon will take you to your account activity page. This is where you can see comments, likes, shares, and follows for your account, as well as the people you are following. You can access your own profile and account settings by tapping on the little icon that looks like a person. Once on this tab, you can choose to once again add new photos and videos, edit your profile and more. While on this page, tapping the 'hamburger icon' in the top right will slide out some more options where you can view your 'saved' posts, access the 'discover people' functionality to connect with your friends from Facebook, or access Facebook directly. We hope this list helped you, and feel free to print it off and share it with your friends if you think it will help them. Knowing the lingo is extremely important when it comes to an Instagram marketing strategy, but even if you aren't using Instagram for business purposes, you should still know enough to be in the conversation! 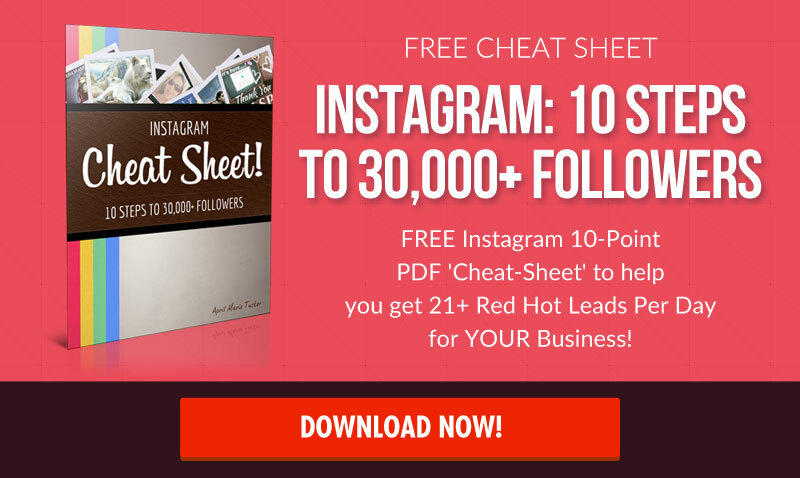 If you are looking to use Instagram specifically for your business, we have a great article that covers how to market on Instagram to start generating leads and getting people to talk to about your business! 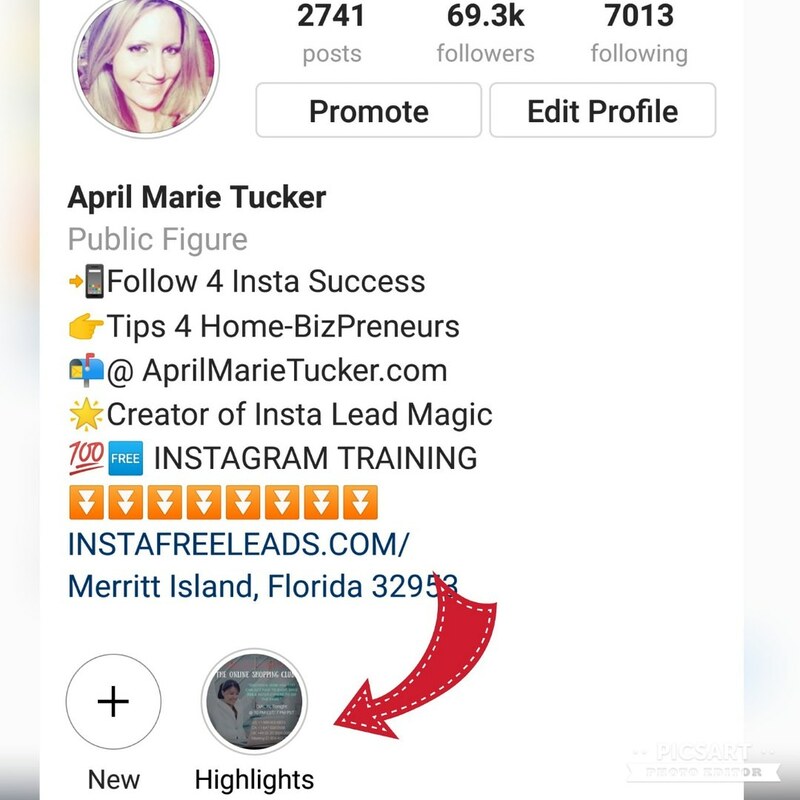 If you’d like to learn more techniques to generate leads and get followers on Instagram, here’s a recommended training video we put together to help more people get leads and sign ups for their home business via Instagram. Enjoy! Very helpful tips, good to know. Thank you April Marie Tucker.